Vibration and Radiation of Musical Instruments Measured with an array of 128 microphones. The vibrations and waves which are radiated from musical instruments are mostly very complicated and built the sound field around the instruments in which we hear or record the music. 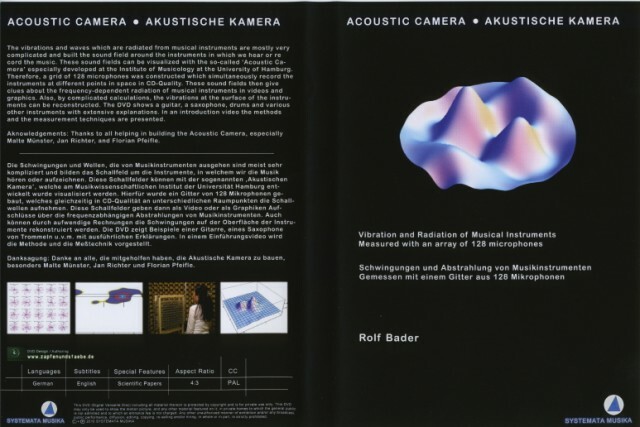 These sound fields can be visualized with the so-called ‘Acoustic Camera’ especially developed at the Institute of Systematic Musicology at the University of Hamburg. This DVD introduces core concepts of the measurement method and shows results for various instruments.